Kevin recently turned 26 and is passionate about theme parks. When he landed a job at Goofy’s Kitchen in The Disneyland Hotel, he was thrilled to be employed at one of the biggest theme parks in the US. 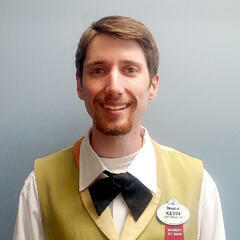 For the past 1½ years, Kevin has worked at Goofy’s Kitchen, located at Disneyland Park in Anaheim, California. While dining at this popular restaurant, customers can meet and dance with Disney characters in a lively atmosphere. As a Host/Cashier, Kevin’s duties include checking in customers, escorting them to their tables, and cashiering. Kevin currently works between 4-7 hours per day and wears a colorful Disney uniform. Kevin is a student at CIP Long Beach, a transition program for young adults with learning differences. Prior to landing a job, he received pre-employment support from his Career Counselor Jocelyn Howard which included a web-based skills assessment, mock interviews, and job coaching. While attending CIP, Kevin took classes at Long Beach City College and had an internship at CVS Pharmacy, where he learned key skills prior to getting hired at Disney. Originally from San Diego, Kevin plans to settle in the Los Angeles area and continue working at Disneyland. He has attended CIP for 3½ years, recently moved into an apartment closer to work, and is living with a friend he met at CIP. Kevin is considering hospitality as a main career someday, but is happy with his current job working at Goofy’s Kitchen and enjoying theme park rides in his spare time. “I feel pretty good about my life now,” Kevin concluded. Click here to learn more about CIP Long Beach.